TOP TEN TUESDAY is a weekly meme hosted by THE BROKE AND THE BOOKISH where participants list their top ten lists of any given subject, given ahead of time. We were allowed to be creative this week, with something romance-themed, and this is something I’ve wanted to do for a little while. So, let me explain this one really fast- These are the books that come to my mind for particular Hamilton songs, especially those of a romantic nature (or not- this could get crazy). I’ll also be including some “Hamilton Confessions,” so get ready to FEEL THE LOVE. Kestrel, from Marie Rutkoski’s The Winner’s Curse series, is exactly this way, to me. She fights with her mind rather than impulse and brute force, and she’s obviously willing to do what it takes to survive and thrive, even when it isn’t want you would expect. And she won’t give that up, even for her own happiness. She suffers in silence, and even though that HURT MY HEART, I applaud her. Also, The Election of 1800 is in my top 3 favorite Hamilton songs, for every reason. Kestrel also applies to Wait For It- I AM THE ONE THING IN LIFE I CAN CONTROL…I’M NOT STANDING STILL, I AM LYING IN WAIT. Woo. Just got a couple shivers. Darrow. 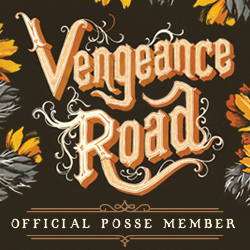 What began as a revolution for a higher cause is becoming his own twisted vengeance, and I’m loving it. There are big things to come from him, and I can’t wait for Morning Star to destroy our souls. Darrow, like Hamilton, is not throwing away his shot on something that isn’t worth it. Oh, Kate. She’s thirsty for revenge, and she won’t let anyone sway her from her purpose. Blood for blood is what she stands for, and after her father’s sacrifice, there is no chance that she will back down from this fight. The emotion and wild hate that eats away at Burr in these last few songs are so characteristic of the villain, and that desperation is what radiates from Kate during portions of Vengeance Road. She demands satisfaction. Read the book to find out if she gets it or not. Oh, I’m so in love with Thomas Jefferson right now. He’s devilish and dangerous and a little bit conniving, but he and Madison are a wickedly wonderful (and often hilarious) team (SUCH A BLUNDER, SOMETIMES IT MAKES ME WONDER WHY I EVEN BRING THE THUNDER) See what I mean? Anyway. In Bone Gap, the status quo has been completely flushed down the drain. People disappear, strange figures creep through the mist, and no one believes the Finn O’Sullivan is telling the truth. But it’s true- life goes on. The issue of immigration is not played around with in Hamilton, and it plays a large factor in Joyride as well. Carly and Arden aren’t supposed to be together, aren’t supposed to even be friends. But they overcome the odds (not just in that) to RISE UP above what everyone expects. If there was ever a book about how decisions affect us, it’s this one. The story of the same girl, paralleled in a ‘what-if’ format, trails through the books, offering us a look at the question we all ask- What if everything was different? This is two different stories, different mistakes: AND LIFE DOESN’T DISCRIMINATE. Even though they’re about two different things, IT’S QUIET UPTOWN has some really relevant lines that apply to All the Truth That’s in Me. I love this book for the fact that the character works through her challenges- without words-and redeems her relationships with those she thought she had lost forever. She does the unimaginable. I’ll be completely honest- the first few times I listened to this, I wasn’t affected. Then one day, I was driving by myself and started BAWLING. And now it doesn’t stop. I cry every time- I can’t pay attention to the words when it comes on, because it makes me so sad, especially now that I know Angelica is there. Full Angelica disclosure to come. This is my favorite one. Teach and Anne are both yearning for more, both yearning for each other, but they don’t rush in like foolish children. Teach is a little headstrong, yes, but he doesn’t go completely mad and act on every random impulse. Neither does Anne. She plans for her future, despite what her heart is telling her. In the same way, Hamilton chooses the path most obvious to find what he wants, and Angelica denies her heart selflessly. She does what she has to do. I’m DYING. But I’ll stop the Hamilton rant for now…because my TTT has gone crazy. But this is definitely the most fun I’ve ever had writing up a post. I hope you all have enjoyed it as well! In case you haven’t heard, Tuesday is Top Ten day here on Get A Bookmark! So this week, I’m counting down my top book crushes- at least the ones I can think of at the moment! Nine is the ultimate warrior. Buff, tough, and gorgeous, he’s not one to shy away from a fight, and his looks really are unearthly. I love Nine because he doesn’t beat around the bush- and living at the top of a skyscraper isn’t too shabby, either. He’s got everything you think you want, and that’s why he made the list. (But ironically, he isn’t number nine). Persistence is the name of the game. Finn never gave up on Hannah in his cheerful, easy way, and he’s the lightness you need on a gloomy day, the flashing smile that immediately brightens your mood. He’s not pushy, but he’s there when you need him, and that’s why Finn is number nine. Swoon. Jase is the total package- gorgeous, fun, relaxed, and a total gentleman. He’s laid-back and sweet, but can be direct when he needs to be. Jase is literally the boy next door- and he lives up to the hype. Everyone loves him, including me, and he’s done everything to deserve that. Saf is cool. Not Jase Garrett cool, but ‘I live in an alternate world and I’m the King of the Theives,’ cool. He’s dangerously mysterious and you never know quite what he’s up to, but you know it’s not good and you know it’s going to get him in trouble- that is, if he gets caught. Which is rare. But he does give evidence, every so often, of an amazing self-sacrificing spirit that makes him throw himself into harm’s way to save those he loves- and that circle is hard to break into. Saf is a heartbreaker for sure, but the one heart he takes care of is Bitterblue’s, and that makes him amazing. As the original of my daydream book boyfriends, Fang obviously deserves a spot here in my list. He’s the epitome of tall, dark, and handsome, and you never know what he’s thinking. He fights hard and loves harder, and that’s just about all you can ask for from a man, right? He’s not higher on the list because as of right now, he’s too young for me, but when I was sixteen he was my total dream guy. So here’s to Fang, for rocking the world. Oh, Arin. So many misunderstandings and so many problems, and still, he stays true. Even when he believes Kestrel to love someone else, he still does not compromise. He’s as loyal as you could ask for, and he’s a handsome, intelligent guy as well- the strong and silent type, if you will, patiently waiting for his chance. Once his feelings are recognized, he wages war to have them returned, and if that doesn’t make him worthy of love, I don’t know what does. He’s certainly got mine. Oh, he’s only everything a (future) historical rich boy should be. Arrogant, funny, disdainful, and not at all what he seems, René is a mystery worth unraveling. He knows what he’s about, and he’s fiercely proud- he will die to defend what he loves. He doesn’t give up, doesn’t let the impossible keep him from trying, and loves with everything he has in his body. The best part? He has RED HAIR. There are so few heroes that have those luscious russet locks, but this Parisian aristocrat has it- and he works it. One flash of his smile and every girl in the room is lost, and he’s got the substance to keep you in love forever. Everyone loves a misunderstood, beautiful boy with no control. You never quite know what you’re going to get with Wolf- he could be a snarling monster, an agile fighter, or an insecure boy with green eyes and a dangerous smile. He’s a contradiction in itself- bred to be a killing machine, but more interested in Scarlet, the girl who sees him for what he really is. He’s as helpful as can be and cute to boot, so why not give him a chance? He comes in at my top three because he has to fight to be worthy of love, and fight he does. And also because I’m dying to see how he saves Scarlet this fall. Fear is number two simply because he’s so different than any other character. He’s not a person- he’s an emotion personified, living in a dimension only one human can see. He’s not perfect and doesn’t try to be, and he’s more honest than almost anyone can claim to be. That honesty makes him a winner, to me, and it doesn’t hurt that he’s tall and blonde and gorgeous (but almost all guys in books are, right?). Here it is. He’s the precious tortured soul who seems like the villain, but you just can’t resist, even if he is guilty. Khalid is a mystery wrapped in an enigma, a quiet darkness that you can’t help but reach into. Not only is he mysterious- he should be all hatefulness and bitterness, but you can catch glimpses of light underneath- but he’s a skilled swordsman and fighter, a king, and has a tiger-like handsomeness that takes your breath away. He is repeatedly referred to as having “tiger eyes” of amber, calculating adn cold, but then he warms up for fleeting moments of breathtaking poetry. 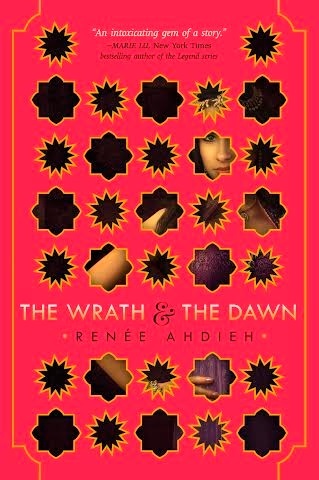 It’s Ahdieh’s poetry, of course, but when you’re reading, you lose yourself in the beautiful, exotic language and the sweeping descriptions. So Khalid is number one, because his character is the most painfully, wonderfully beautiful of all. Who are your favorite fictional crushes? I’d love to know, so post a comment! My thoughts: This book. Wow. And again, wow. I understand the praise on the back of this one, which is from two amazing authors. This book made time explode for me. I thought I was reading for about ten minutes, but nearly forty-five had passed. I finished this one in half a day, and I don’t regret that time for a moment. I would do it again. Here’s why. A lot of these books- the forbidden love, the dangerous elite society catching on, etc. are predictable. You know the love story will happen in the first three or so chapters, and what’s left is all secret meetings and soft glances, maybe a stolen liaison or two. Not so in The Winner’s Curse. The romance develops in the challenges, the angry truths, the realization that even though they can infuriate each other, there’s an understanding that overreaches the world they live in, and they will change the world for each other. And the writing. Oh, the writing. I am in raptures. Sweeping, elegant, beautifully painful at times, Rutkoski captures what it means to write a novel that takes you into its world. Some authors have a hard time describing a foreign world in a way that makes it both understandable and yet still uniquely beautiful, but this author certainly does not, capturing the essence of the Valorian world and the beautiful, rich culture of the Herrani. While I loved the conflict between Arin and Kestrel, the conclusion of the book tugged at me, confused me just a little, and left me…unsatisfied. While we see the reasoning, of course, it still feels just the slightest bit forced, like Rutkoski herself was pained to write it. Contrary to popular belief, if your writing is as good as Rutkoski’s, you don’t need to end with a cliffhanger, but she did, and it felt so…wrong that I just couldn’t appreciate the thrill. The most unsettling thing in this book is the way the Herrani are treated as the slaves of the Valorian, and the descriptions of their rebellion. Many people die, by the sword or by poison, and a popular punishment is the cutting off of the ears and nose. Slaves are also beaten and verbally mistreated, spoken to like animals and insulted to their face. When the Herrani take revenge, they do it with a bloody overthrow, and the violence does continue when the Valorians return to attempt to retake the city. 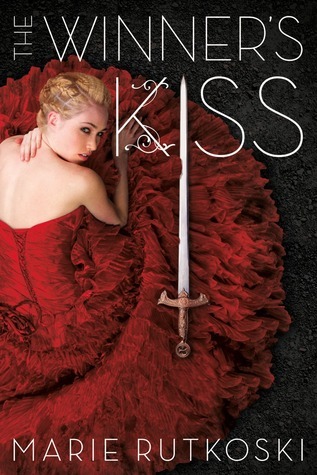 This is also a romantic novel, and while there are no scenes of a sexual nature between Arin and Kestrel, they do kiss a few times. Additionally, after the (SPOILER) Herrani revolution, their leader, a man called Cheat, makes unwelcome advances toward Kestrel until Arin comes in and kills him. I have a lot of respect for Rutkoski, coming out with a book as stunning as this one. 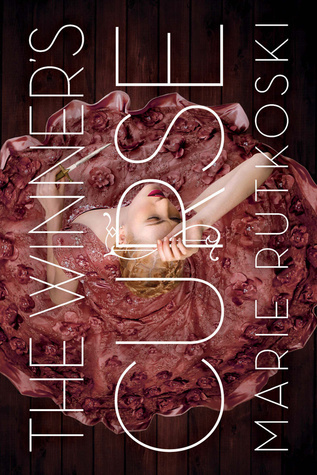 Although the sequel didn’t impress me nearly as much (review coming soon), The Winner’s Curse will remain in my memory as one of the best books I’ve read in a long time. Of course, you may have a different opinion, and I would love the feedback! Questions? Comments? Have a book you’d like me to review? Post a comment below and tell me what you think!